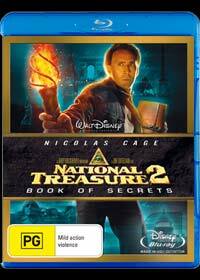 The Blu-ray version of National Treasure 2: Book of Secrets finally arrives and takes the viewer to the next level of this highly popular series. The original film, National Treasure was a huge success at the movies and this sequel returns the original characters to the franchise plus a few new fresh faces. Best described as a modern Indiana Jones film, National Treasure 2: Book of Secrets features action, drama and comedy that is thoroughly entertaining from start to finish. Even though sequels are generally tainted as not being as good as the original, this sequel far excels over the first movie in terms of story and special effects. Once again Nicolas Cage returns as Benjamin Franklin Gates, a treasure hunter who vows to redeem his ancestor’s name that has been blamed to be part of the conspiracy against President Lincoln. However, as he delves into the history, he discovers the existence of a book that holds all of the world’s secrets. Unfortunately for Gates, Mitch Wilkinson (Ed Harris) also wishes to claim the book as his own and truly makes a great modern villain. Jon Voight returns as Benjamin Franklin Gates father Patrick and Helen Mirren makes her debut as his estranged wife. Travelling around the world from Paris to London and the majestic Mount Rushmore, the film contains some great action sequences and some over the top plot lines that actually makes the movie quite endearing. Although Diane Kruger returns as Abigail Chase, Ben’s ex-partner, her role is a little limiting in this sequel which is a shame. However at the end of the day, the relationships between the characters are great with some great comedic moments that makes this an action move that can be watched by everyone. On Blu-Ray, the video and audio quality is outstanding and is probably one of the most impressive blu-ray discs available with exceptionally sharp picture quality, vibrant colours and perfect audio. Match that with a plethora of interesting and entertaining special features and this is one first class blu-ray presentation!